Conant Automotive Service and Repair prides itself on its high quality automotive service facilities and qualified, certified auto technicians. Locally owned by Joe and Erin Conant and located conveniently in Stoughton, Wisconsin, they repair all makes and models of cars and trucks, domestic and imports. Since starting Conant Automotive in 2006, the team of certified technicians goes above and beyond just servicing your vehicle or fleet of vehicles. They carefully assess the service situation and counsel you on how to proceed and provide alternatives. This attention to detail and customer service has resulted in Conant Automotive earning high marks for customer satisfaction and earned the trust of its clients. Joe, Erin and their staff know they do not have to be the biggest shop to get the job done. Also, they know spending money on car, truck or fleet vehicle repairs isn’t anyone’s first choice. So, they get the job done right in a timely manner to get you back on the road safely. Conant Automotive Service and Repair is family owned and operated with most of its employees and their families living in Stoughton where they work. It is no surprise that Joe and Erin Conant and their staff take time to give back to their community. The United States Marine Corp Fallen Warrior program. Conant Automotive supports additional churches and organizations in need and has received recognition for the generous contributions. The Automotive Training Institute (ATI) ranked Conant Automotive as one of the Top 75 automotive shops in the nation in 2012. Over 1500 auto service shops were eligible. Also in 2012, Conant Automotive was one of the top five buyers at the Dane County Fair Animal Meat Sale. In 2011, Conant Automotive was the recipient of the Best Local Business Award from the FFA. Conant Automotive proves time and time again that its family of qualified, certified, experienced technicians will take care of your family cars, trucks or fleet of vehicles because it cares about its customers, quality of work and the community. Owner Joe Conant is a graduate of Stoughton High School and continued his education in Automotive Technology at Madison Area Technical College. His over 20 years of experience in the automotive service and repair industry includes certification from the National Institute of Automotive Service Excellence (ASE) and General Motors (GM) training. 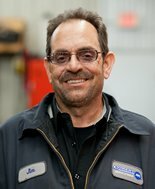 Joe enjoys every day talking with people who come into the service facility. Joe and his wife, Erin are busy with the business but also raising their five children. While Joe’s spare time is very limited he loves being at home with his family, church service on Sunday morning and helping community organizations whenever possible through the business. Greg graduated from Stoughton High School and headed to Madison Area Technical College (MATC) to study Automotive Technology. He graduated in spring, 2013. He arrived at Conant Automotive ASE certified and has four years of industry experience. Also a city of Stoughton resident, Greg goes places and does other things when he is not at the Conant Service and repair facility. 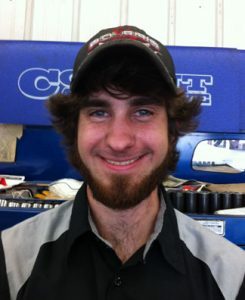 He enjoys the farming life and drag racing. Greg is known to be found at the Byron Raceway in Byron, Illinois absorbed in his love of drag racing. Originally from Boscobel, Jason moved to Stoughton while in grade school, graduating from Stoughton High School in 1996. 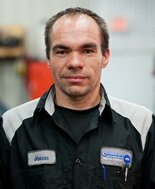 Armed with 18 years of automotive service experience, Jason is both an ASE Master Certified Technician and an ASE Advanced Level Certified Technician. Happily married with three children, Jason loves camping with his family and coaching little league baseball. Bernie graduated high school up north from Rhinelander High School. He ventured to Madison and furthered his education in the Automotive Technology Training program at MATC. 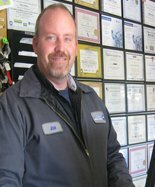 His 20 years of experience adds to Bernie’s ASE Certification as a Service Advisor. He is married with three “beautiful” kids and finds time to play with them when he is not working. Bernie plays softball and is a fisherman, too. In fact, if you ask him about his fishing exploits, you may hear how he caught an eight (8) foot Sailfish. Born and raised in Stoughton, Jim attended Stoughton High School. 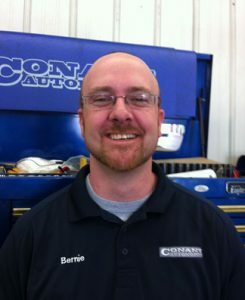 He has been in the auto industry for one year with Conant Automotive. As a general laborer, detailing cars, transporting customers, and keeping the shop clean and orderly are among Jim’s top priorities. Jim is married and blessed with one child as well as 4 grandchildren. When not working he shares time with family and enjoys an occasional round of golf.